Athlete, musician, dancer, family man, champion of charitable causes, civic-minded citizen, successful business man and host with the most on the ball. John S. Hunsinger, native Atlantan, is all of these. He grew up in West End, in a one-bedroom house he shared with his mother, grandfather and three uncles. Today, he lives in a four-bedroom, four-bath home on an acre on fashionable West Wesley Road. He is president of one of the largest real estate companies in Atlanta. When he started his firm in 1969, it grossed $1 million in sales. Last year it grossed $130 million. When he was a pre-teen, it would have taken no genius to predict Hunsinger’s success. In the morning before school, he had a newspaper route for The Atlanta Constitution. Before dinner and after school and games of football, basketball or baseball, he delivered newspapers for the old Atlanta Georgian. In the evening he studied and took music lessons on the French horn and trumpet. At Brown High School, he led the football team to the state championship and was named on the All-City, All-State, All-Southern and prep All-America teams. He was chosen Back of The Year for the state of Georgia by the Atlanta Touchdown Club. Talk about the all-round student: Hunsinger played baseball and basketball, as well as trumpet in the school band. He was a straight A student and class valedictorian. He was sought after by almost every college in the Southeast but he decided to follow in the footsteps of his great uncle, the late George “Pup” Phillips, an All-America center at Georgia Tech in 1916, and his father, John K. Hunsinger, who played on the 1928 Tech Rose Bowl team. At Tech, he played running back on offense and linebacker on defense. His freshman team was undefeated. 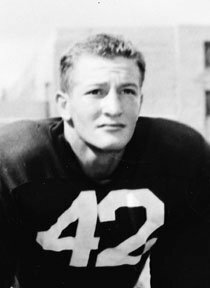 During his sophomore season in 1952, his Yellow Jackets were not only undefeated but declared national champions by the International News Service. He played in three bowl games, twice in the Sugar Bowl and once in the Cotton Bowl. The Jackets won all three. His studies never suffered: He was named to the Academic All-America football team and twice received the top academic award in the Industrial Engineering department. Today Hunsinger is 72 years old and looks 50. At 5-10, 179, he is fit enough to get into his old Tech uniform. He exercises daily, running three miles before he goes into his office at 8 a.m.
No one has given more to the culture or charitable needs of Atlanta than John Hunsinger. He sings with the Atlanta Symphony and the St. Anthony Church choir. He serves or has served on the boards of the Atlanta Union Mission, the Episcopal Church Foundation, Children’s Health Care of Atlanta, Boys and Girls Clubs of Metropolitan Atlanta, Atlanta Fine Arts Guild and Atlanta Urban League, among many others. His sports promotions raised more than $1 million for the old Scottish Rite Hospital. Hunsinger has been married to the former Kathy Blalock for 19 years. They have two sons, Jonathan, 15, and Matthew 10. Both are athletes. Hunsinger has three children by a previous marriage, John Jr., 43, a teacher, painter and circus performer; Hall, 42, an off-Broadway actor in New York; and Robbie Lynn, 39, who plays the oboe with the Atlanta and Chicago symphonies. No matter how big a real estate deal he may be involved in, no matter what social function or board meeting he has scheduled, nothing interferes with being there when his children are performing. Ten times a year he gives a gala party in the lobby of his office building for approximately 100 of his agents, clients, tenants and friends. The Hunsinger building is located at 1627 Peachtree St., two doors north of The Temple. Every year, for the Jewish High Holy Days, Hunsinger, an Episcopalian, reserves 90 percent of his parking lot for Temple congregants who are too late to find space in The Temple lot.